For every damage Guo Jia takes, he can do a judgment. If it is red, he keeps that card. If it is black, he can move anyone's general card out of the game. Guo Jia can choose to not draw, but instead reveal the top three cards from the deck. He then chooses one color and puts all of these cards with that color in his hand. He gives the rest of the cards away to any number of players. "Strange Assistant" works on a 'per damage' basis. If he gets hurt two at once, he can do two judgments. "Stroke of Brilliance" is done instead of drawing, so it cannot be done if Guo Jia does not have a drawing phase. 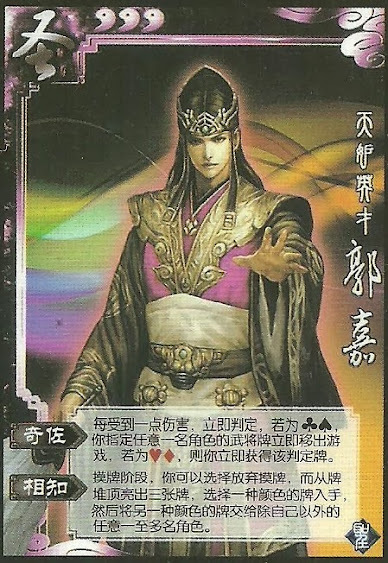 When Guo Jia gives away cards using "Stroke of Brilliance", he can give them out in any way he chooses, much like in Liu Bei's "Kindness". Guo Jia must give the remaining cards away in "Stroke of Brilliance".